The Analysis widget provides an easy way to use ArcGIS Online or ArcGIS Enterprise spatial analysis tools in your application. With 25 analysis tools, you can configure one tool or multiple tools in a widget. 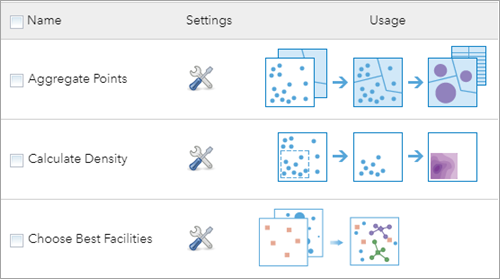 See the Perform analysis section of the ArcGIS Enterprise help for an introduction to spatial analysis, the license requirements to access analysis tools, and details about the usage of each tool. If you're a developer, you can access these tools via web APIs. For more information, see Spatial analysis service REST API. Using a spatial analysis service consumes credits. For more information on credits, see Service credits overview. Analysis tools must have access to the data used by the layers and services on which you run them. If you use ArcGIS Server map or feature services, the analysis tools must have access to the data; therefore, the URL to the service must be a public URL or be on the same network as your portal. Tools are listed alphabetically in the configuration window. Choose the tools you want to include in the widget. The tool display name—Provide your tool name. Show help links in the widget—Controls whether to show help links in the widget. Show option to use the current map extent—Controls whether to show the option to use the current map extent. Display Show credits option—Controls whether to show the credits link. Save the result in user's account—Controls whether to allow users to save the result in their accounts. Show ready to use layers from ArcGIS Living Atlas of the World—Controls whether to show ready-to-use layers from ArcGIS Living Atlas of the World. Allow to export results---Controls whether to allow users to export the result to CSV, Feature Collection or GeoJSON formats. Make sure the Include route layers option is checked when you run the tool in the widget. Add the Directions widget in the app. Repeat step 3 if you have more than one selected tool. Certain tools need additional privileges such as network analysis and GeoEnrichment. See Perform analysis for more information. If you don't have required privileges, the corresponding tools will not be available in the widget panel. Go over the Publish Routing Services Utility topic to learn specific information on data requirements. Verify that you are signed in to your organization with privileges to perform analysis. Click the widget icon in your app to open the widget panel. If more than one tool is configured, choose tools one at a time to execute. If only one tool is available, it activates automatically. Click the help icon for information about the tool. If you don't have required privileges to run a tool, the tool will not display in the widget panel. In addition to privileges, each tool has its own requirement for the layer or layers. If a tool does not have a required layer or layers in the map, the tool will be unavailable. Also note that the Extract Data tool requires the extract capability be set in the service. Choose an input layer from the drop-down list, configure the parameters for the tool, and click Run Analysis. For more information about the configuration dialog box, see the Work with a tool dialog box section of the ArcGIS Online help or Use Analysis tools in the Portal for ArcGIS help . When the tool is running, the execution messages display in the panel. Click the cancel icon if you want to cancel the job. A job for a tool consuming credits cannot be cancelled. When the job is successful, the result is saved to My Content in the Contents page. Click the item link under Outputs to view the item details in your portal. 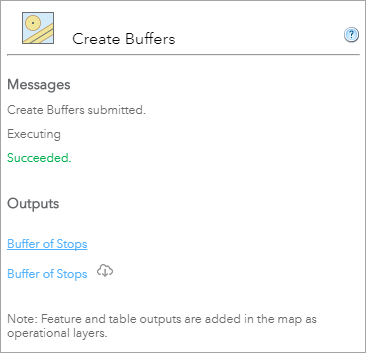 In addition, the results as a feature layer or layers or a table or tables are automatically added to the map as operational layers. If the job is not successful, an error message displays in red. Click Back to return to the parameters' configuration. Additionally, you may see the output name with an export button if you choose the option to export the files. If you have more than one tool, click Home to choose other tools. Below is a list of analytical tools that require a standard or advanced GIS Server license. Requires additional configuration of a network service. This can be an Esri provided service or your own – see Directions and Routing for more information. Requires additional configuration of an elevation service. This can be an Esri provided service or your own – see Elevation for more information. Requires additional configuration of a hydrology service. This can be an Esri provided service – see Configure utility service: Hydrology for more information.